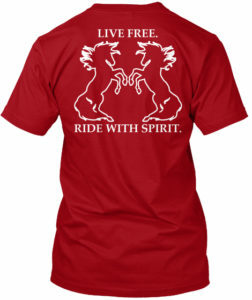 Here at Free Spirit Farm we’re horse people. Plain and simple. With over 20 years of experience we’ve got a lot of wisdom (through trial and error) that we’re happy to share with our clients, especially those certain products we’ve come to rely on because they actually work! 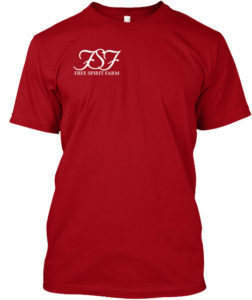 Shop FSF Gear at our Online Store! Check out shirts, sweatshirts, stickers, mugs, bags, and more all available directly from our online store. Cosequin has always be the leader in joint supplements and it’s worked well for many of our equine friends. 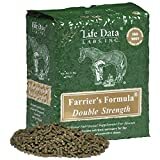 With several barefoot horses, Farrier’s Formula has worked wonders on many of them! What’s old is new again. The traditional mohair cinch has seen a resurgence of late. I always wrote them off until recently when my own horse Gypsy started getting heinous girth galls. I read that the real 100% mohair cinches like this one allow for breathability, and stretch in ways that I hadn’t suspected. I LOVE my helmet! It wasn’t cheap but it feels like pillows hugging my head! For those of you just starting out here are some helmets like the ones we use for lessons. I listen to audible all the time while doing my chores its a great option for those of us on the go!